On the morning of February 1, 1941, the Ramsey Home Guard received word that a suspected spy (Josef Jakobs) had been discovered in a field near Dove House Farm. Situated near the RAF Upwood airbase, the Home Guard was primed to be on the lookout for suspicious folk. A simple phone call by Home Guard Volunteer James Harry Godfrey, to the local police station, tapped into the eager resources of the local Home Guard. 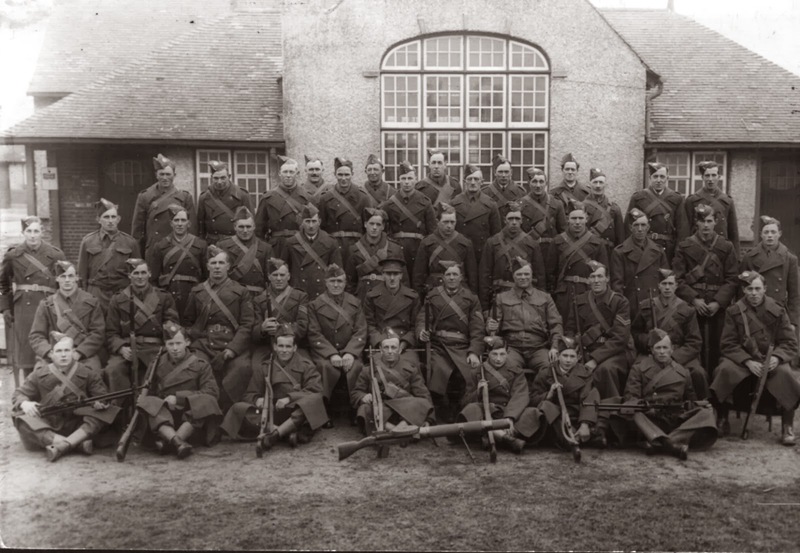 Captain William Henry Newton, Officer Commanding the Ramsey Company (Home Guard) and Lieutenant John Curedale, Platoon Commander (Home Guard), drove out to Dovehouse Farm and took Josef Jakobs into custody. After delivering the captive spy to the police station, the role of the Home Guard was over, for the moment. Eventually, on August 4, 1941, both Godfrey and Newton would be called to testify at Jakobs' Court Martial Trial in London. Lieutenant John Curedale had been called up into the regular Armed Forces and was excused from testifying. As well, there are numerous sites for the local companies of the Home Guard. But the one that interests me the most is the Ramsey Home Guard. After a fair amount of searching on the internet and a foray through the Ramsey Rural Museum, I came across the website for the Ramsey and District Community Archive. It was there, in searching through an archive of images that I came across a 1941 photograph of the Ramsey Home Guard company (which also identified some of the men). In the middle of the photograph, in the second row from the bottom, sits Captain Newton. I imagine that James Harry Godfrey is somewhere in there as well... and even perhaps Lieutenant John Curedale (if he hadn't yet been called up the regular services). It is satisfying to finally be able to put a face to this Captain W.H. Newton, a man who took my grandfather into custody on behalf of the King. Seeing this photograph, seeing these men portrayed, fleshes out the whole encounter for me. They are no longer the faceless ones, but take on a life of their own. They had families too. They had homes to protect. They were doing their duty and protecting all that was dear to them.